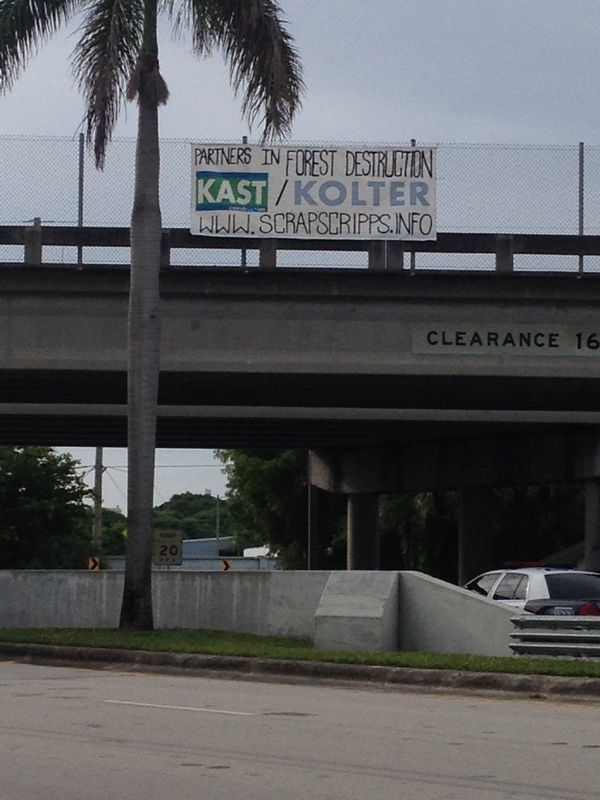 This morning, a banner calling KAST and Kolter “Partners in Forest Destruction” was dropped over Okeechobee Blvd in West Palm Beach, Florida, to bring attention to the clearing of the Briger Forest. Kolter is the company responsible for the Alton Homes project that threatens to destroy a majority of South Florida’s Briger Forest—home to bobcats, sandhill cranes, the threatened Gopher tortoise, the endangered hand fern, and countless other wild species. KAST is the construction company whose bulldozers and excavators are currently ripping up the forest floor, tearing down the slash pines and saw palmettos, and displacing animals with nowhere else to run. This action took place on June 11—International Day of Solidarity with Marius Mason, Eric McDavid, and all Eco-Prisoners—to show solidarity with all those who have risked their freedom fighting to protect Mother Earth. 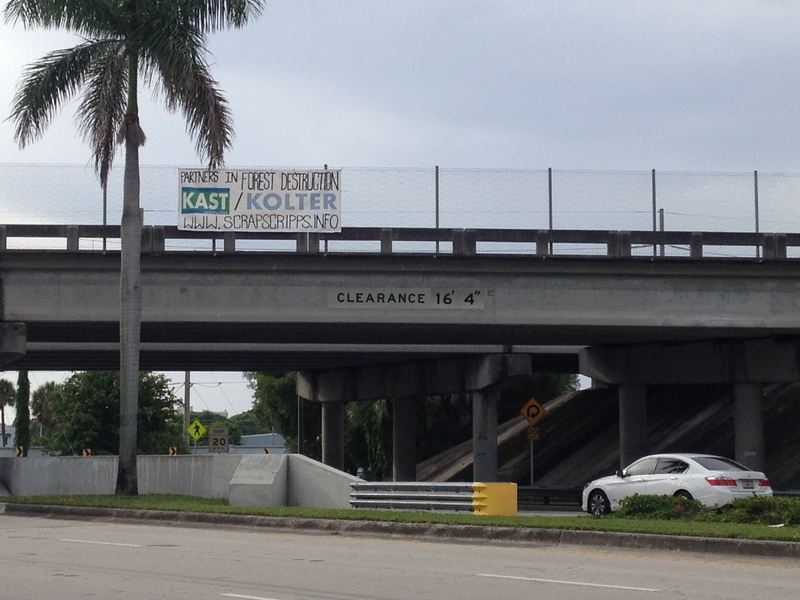 The banner hung near Kolter’s downtown offices during morning rush hour traffic, reminding Kolter employees on their way to work that they are responsible for the desecration of the Briger Forest, just one piece of the rampant development that threatens the entire Everglades bioregion. Plans to destroy the Briger Forest do not end with KAST and Kolter, as The Scripps Research Institute has hopes to incorporate Alton Homes into a larger biotech city, complete with animal testing laboratories and a recreation center. Activists in the area have been opposing this project for almost a decade, and will not stop until the forest is protected once and for all. To follow the campaign, go to scrapscripps.info and evergladesearthfirst.net. For more information on June 11, check out June11.org.